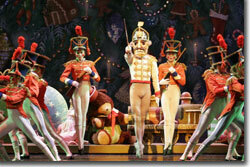 What has made The Nutcracker, which languished after its premiere, a holiday ritual? A combination of choreographic refinements, reinterpretations of the story—from the books by Alexander Dumas pére or Lev Ivanov adapted from E.T.A. Hoffmann (yes, the same of Offenbach's opera, The Tales of Hoffmann)—and the enduring nature of Tchaikovsky's music, the Nutcracker Suite. As a ballet, it is a delight because it balances the pas de deux (Sugarplum Fairy and Cavalier; Clara and the Nutcracker Prince) and ensemble numbers, (Snow and Flowers) on the classical side, and the various ethnic dances on the folk side. Such a broad set of demands always reveals the depth of a company and Colorado Ballet has done a top notch job of meeting and exceeding all expectations for many years. One may quibble about the set change a few years back (the present one is not as elegant and more dated than the old one), but the choreography of former artistic director Martin Friedmann, with some additions by Sandra Brown, remains an artistic highlight, which makes for interesting comparisons from year-to-year. On opening night, it was a delight to see Sharon Wehner's commanding technique as Sugar Plum in the sure hands of Igor Vassine (the Cavalier), especially for the fancy flips and daring finishes. Vassine's solos and impeccable timing are always stunning. Wehner shines in her solos as well. Viacheslav Buchkovskiy's suprising strength as the Nutcracker Prince made for a perfect pairing with Dana Benton as Clara, topped off with confident, smooth lifts. The magic begins with the arrival of Drosselmayer (the inimitable Gregory K. Gonzales, whose pantomime ranks with the best) and the introduction of the Columbine Doll (Asuka Sasaki) and the Soldier Doll (Adam Still), whose mechanical antics delight stage and audience children and adults alike. Hoffman's tale is obviously influenced by the late-Nineteenth Century flowering of psychology, for example, the parallels between the taunting Clara Stahlbaum receives from her brother Fritz and his friends and the Mouse King and Mice attack she experiences in her dream, or the direct projection of her romantic dreams onto the doll Drosselmayer has given her and its transference onto the Nutcracker Prince. All of this leads to a fanciful world—the Kingdom of Sweets—a hyperbolic re-imagining of the real world ornaments on the tree, the presents beneath, and the seasonal goodies and libations served at the Stahlbaum's gathering. 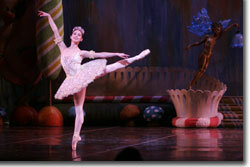 The variations begin with Spanish Chocolate (Casey Dalton, Cara Cooper, and Kevin Gaël Thomas), full of pizzazz. Maria Mosina and Dmitri Trubchanov's Arabian Coffee ranks among the most seductive we've seen. We are wowed by Trubchanov's incredible strength, entering and exiting with Mosina held fully aloft in a dramatic upside-down display. Chinese Tea, with Sean Omandam's well-timed vaults and a sassy dragon, is a delight. The surface propriety of the Marzipan confection (Asuka Sasaki, Caitlin Valentine, and Adam Still) pleasantly unfolds into a coquettish bauble. Andrew Skeels, Luise Valdes, and Janelle Cook put on an exuberant and showy Russian Trepak. The stalwart Mother Ginger (Ryland Schwab's contemporary dance moves are always a hoot) and her polichinelles (one of many supporting ensembles provided by the Academy of Colorado Ballet) provide emphatic punctuation to the evening's comic relief. The Waltz of the Flowers, highlighted by Dew Drop's (Sayaka Karasugi) fluid solo, sets up the the Grand Pas de Deux for the lead pairs. Here, in the Dance of the Sugar Plum Fairy, a series of perfect lifts and swings, then Vassine's elegance and ease and Wehner's ethereal presence followed by a second, more muscular, set of solos and a sumptuous reprise of the dancers, delivers us to the end of our wholly satisfactory visit, before we are, in this interpretation, left with Clara dreaming with her nutcracker doll as her godfather, Drosselmayer, looks on. Adam Flatt and the 40-member orchestra deftly bring the famous score to life. 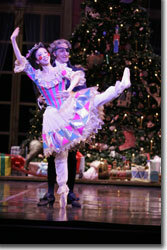 The Colorado Ballet's 2009 The Nutcracker runs through Sunday, December 27th, including weekday and afternoon performances. 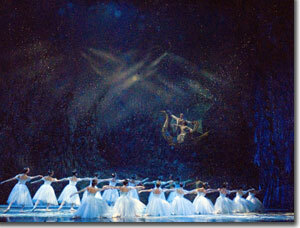 303-837-8888 or www.coloradoballet.com.